The students in our introductory astronomy course recently completed a problem set in which they estimated the mass of the atmosphere surrounding a Super-Earth given the planet radius calculated from the transit depth and the planet mass calculated from the radial velocity curve. In this paper, Ikoma & Hori take a much closer look at Super-Earth atmospheres to investigate whether a rocky Super-Earth would be able to accrete a thick hydrogen/helium atmosphere in-situ (i.e., without migrating inward from the colder, outer reaches of the protoplanetary disk). Ikoma & Hori find that in-situ accretion of thick hydrogen/helium atmospheres is possible if the proplanetary disk is sufficiently long-lived and/or cool enough that the planet has time to accumulate a thick atmosphere before the disk dissipates. Their results are consistent with models of the low-density super-Earths in the Kepler-11 system and provide valuable insights into the formation and interior structure of Super-Earths. Ikoma & Hori begin their simulations by embedding a hot, newly formed Super-Earth in a protoplanetary disk. The Super-Earth has a rocky core and an atmosphere that merges directly into the gas disk. Throughout the simulation, Ikoma & Hori require that the temperature and density at the edge of the planet’s atmosphere match the temperature and density of the surrounding gas disk. They also require that the temperature at the base of the atmosphere is consistent with the outward energy flux from the rocky core due to the decay of radiogenic elements and the cooling of the core. On the surface, Ikoma & Hori apply the same methods as our introductory astronomy students: they integrate the equations of hydrostatic equilibrium, mass conservation, energy transfer, and energy conservation to model the planet’s atmosphere as the protoplanetary disk dissipates. Our students assumed an ideal gas equation of state, but Ikoma & Hori use a more sophisticated low-mass star and giant planet equation of state from Saumon et al. (1995) that includes the effects of ionization and partial dissociation. 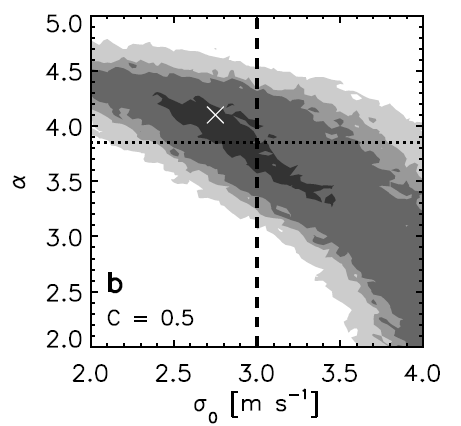 Ikoma & Hori assume that the gas density in the protoplanetary disk decays exponentially and they vary both the dissipation time and the initial disk temperature. The figure below plots the relative mass of the atmosphere as a function of time. 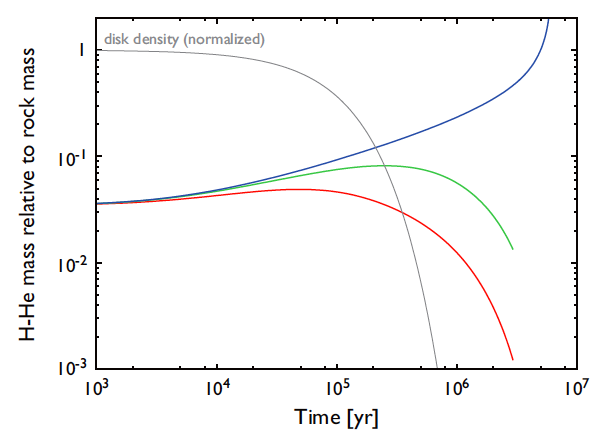 The blue line illustrates the comparison case in which the disk density is constant. In this case, the Super-Earth accumulates enough gas to reach the runaway (accelerating) gas accretion phase, causing the planet to accumulate an atmosphere much more massive than those of the Kepler-11 Super-Earths. The red and green lines display the evolution of the atmosphere for two cases in which the density of the disk decays exponentially as shown by the grey line. The difference between the green and red models is that the red model accounts for heating due to the cooling of the core while the green model neglects that effect. Ratio of atmospheric mass to rocky core mass as a function of time for three different models. The blue line model displays runaway accretion in the case where the gas density is constant. The red and green models assume that the gas density decays exponentially as shown by the grey line. The red model includes the heat capacity of the rocky core while the green model neglects that contribution. Figure 1 from Ikoma & Hori 2012. In both cases, the atmospheric mass grows gradually for roughly 105 years (the dissipation time of the disk) before starting to decrease. The atmospheric mass decreases because the exponential decay of the gas disk density has increased the pressure gradient at the edge of the planet’s atmosphere and caused the atmosphere to expand outward. The particles at the edge of the atmosphere are now farther from the planet and escape more easily. The red model experiences more atmospheric loss than the green model because the heat from the core increases the temperature of the atmosphere and causes the atmosphere to expand further than in the case where the rocky heat capacity is neglected. The authors find that the final mass of the hydrogen/helium atmosphere depends sensitively on the initial mass of the rocky core. For small choices of core mass, the atmospheric mass increases gradually with core mass. At and above a critical core mass, however, the atmospheric mass skyrockets because the rocky core is able to accumulate enough atmospheric mass to reach the runaway accretion phase before the disk dissipates. The specific value of the critical core mass depends on the disk dissipation rate because more massive cores reach the runaway accretion phase more quickly. Ikoma & Hori compare their results to structural models of the five Super-Earths in the Kepler-11 system. 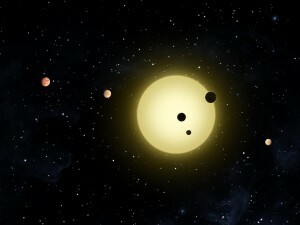 As shown in the figure below, four of the five planets (all but Kepler-11f) have atmospheric mass fractions consistent with in-situ accretion of gaseous atmospheres in a disk with an initial temperature of 550K. All five Super-Earths are consistent with a cooler initial disk temperature of 200K. 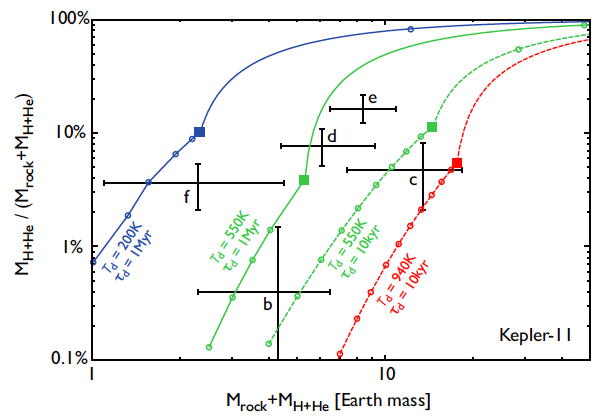 Atmospheric mass fraction versus total planet mass for the five Super-Earths in the Kepler-11 system (black crosses) compared to model ratios for given initial conditions. The solid (dashed) lines represent models with disk dissipation timescales of 1 million years (10 thousand years). The blue, green, and red lines are models with initial disk temperatures of 200K, 550K, and 940K. The squares mark the critical mass at which runaway accretion begins. Figure 3 from Ikoma & Hori 2012. Stepping away from the Kepler-11 system, this paper demonstrates the importance of carefully monitoring both the dissipation of the protoplanetary disk and the thermal heat flux from the core when modeling the formation and evolution of Super-Earths. Establishing the atmospheric mass fractions of Super-Earths is a challenging problem, but Ikoma & Hori have brought us one step closer to breaking the degeneracy between rocky Super-Earths and gaseous mini-Neptunes.